Boil the egg noodles for the time directed on package. While egg noodles are boiling, in a large mixing bowl combine chicken, cream of chicken soup, sour cream, cheddar cheese, mixed vegetables, onion powder, garlic powder, salt and pepper. Mix to combine. Once noodles are done, drain and add to the mixing bowl. 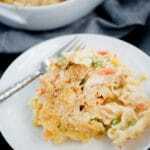 Add mixture to a greased 13×9 casserole dish and spread evenly. In a food processor, blend the croutons until they area fine crumb. Spread croutons evenly across casserole. Spray the top lightly with cooking spray. I like to use a Misto filled with avocado oil. Bake 30-35 minutes until bubbly. If your bread crumbs begin to brown before the casserole is complete, top with foil for remaining cooking time.